We read the book Clifford's Family. Then we made a venn diagram to compare who has brothers, who has sisters, and who has both. We compared our families to Clifford's and we shared stories about our brothers and sisters. My teammate had her students brainstorm things that Clifford needs. Read Clifford's First Day of School. Then have students brainstorm things Clifford would like at school. 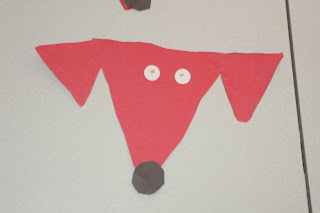 We made these Clifford faces by clipping the bottom corners on a large red square for the face and 2 long rectangles for the ears. Then we clipped corners and rounded on 2 white rectangles and 1 black square. We painted on the eyes and whiskers. Read Clifford's ABC book and make a class ABC book.My teammate's class made this book. These ideas and several others can be found listed on this web site.